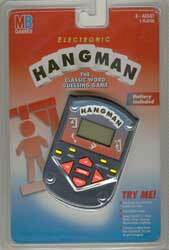 Electronic hangman game for 1 player - it's addictive! Batteries included! 2 ways to play! 3 different skill levels! Don't make too many wrong choices or you're hanged!